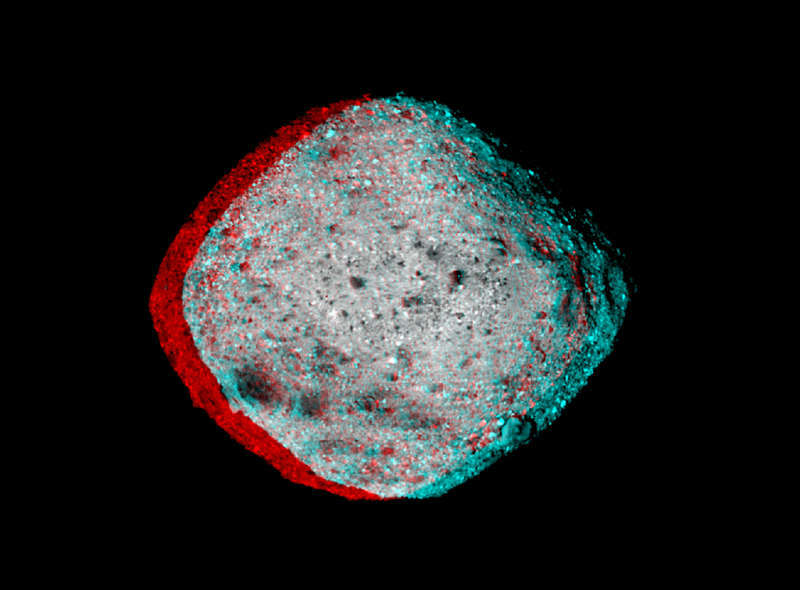 Explanation: Put on your red/blue glasses and float next to asteroid 101955 Bennu. Shaped like a spinning top toy with boulders littering its rough surface, the tiny Solar System world is about 1 Empire State Building (less than 500 meters) across. Frames used to construct this 3D anaglyph were taken by PolyCam on board the OSIRIS_REx spacecraft on December 3 from a distance of about 80 kilometers. Now settling in to explore Bennu from orbit, the OSIRIS-REx mission is expected to deliver samples of the asteroid to planet Earth in 2023. Samples of dust from another asteroid will streak through Earth's atmosphere much sooner though, when the Geminid meteor shower peaks in predawn skies on December 14. The parent body for the annual Geminids is asteroid 3200 Phaethon.